Generally your upholstered furnitures are considered as haven of comfort. Your upholstered dining chairs give you so much comfort while you sit for dinner. In order to get the best out of it you need to take care of your upholstered pieces. You need to clean your upholstered chairs preferably once a week and deep cleaned once a month. Here are some handy tips your upholstered furnitures will get from professional dining chair cleaning service. First let’s check out the things you may need to do the job. You need a dry cloth, a vacuüm cleaner with upholstery attachment, a bowl of water, upholstery cleaner and a brush for multipurpose use. Upholstery materials vary from fabric, leather and leatherette; the cleaning process and the solvent used are slightly different. Professional cleaning services for upholstered dining chairs Melbourne have the expertise with right cleaning procedure and materials. 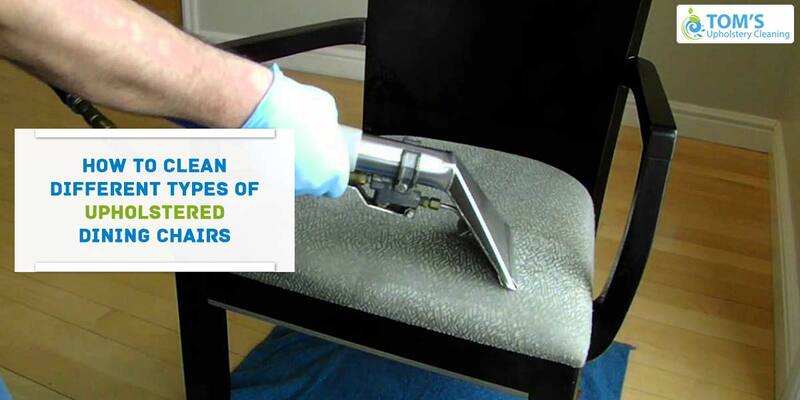 Stains on your chairs may come from different sources. It might be mud, cigarette burn, candle or wax or even insect or fly speck stain. Major food spills are a headache. So the first thing to do is to find all the stains and spills apart from the general dusting. How to Clean Upholstered Dining Chairs? Vacuuming the chair is done on all three materials. First you remove furniture cushions and vacuüm surfaces using a vacuüm attachment. Vacuum the seams, and all over the body. Follow direction of the upholstery attachment. After vacuuming the chair is sprayed with upholstery cleaning material. You can also make your own non-toxic and natural water-based upholstery cleaner by mixing 4 cup of dishwashing soap to one cup of warm water. Apply an electric mixer so that the liquid turns into thick foam. Spray lightly and not directly on the fabric. In case of leather upholstery you can use leather cleaner. Use liquid dish soap for Leather Furniture. Then use a microfiber clean cloth and evenly scrub the upholstery in a circular motion to wipe off the cleaning solution entirely. If you are just going for an overall clean, microfiber is ideal. For more soiled areas, it is better to use a scrub brush as it cleaned the corners as well. You can alternatively go for steam cleaning. The high temperature and high pressurized steam releases dirt, grease and grime. Moreover, it kills germs as well without the use of any chemical. If you do not have a steam cleaner, work a little more, give the chair a good scrub with the microfiber cloth dipped in dish soap mixture. Even if the stain remains, try once more, this time using hydrogen peroxide and a microfiber cloth. Leave the chair to dry completely and notice the change yourself. In order to keep the look, spray with a stain guard treatment which is available in the market. The whole process is really simple and all you need is patience and concentration. However, if the stains are stubborn and unmanageable, you will have to contact professionals. There are professionals in Melbourne who are ready to take care of your upholstered chairs. Call Toms Upholstery Cleaning Melbourne and see your upholstered chairs turn new!